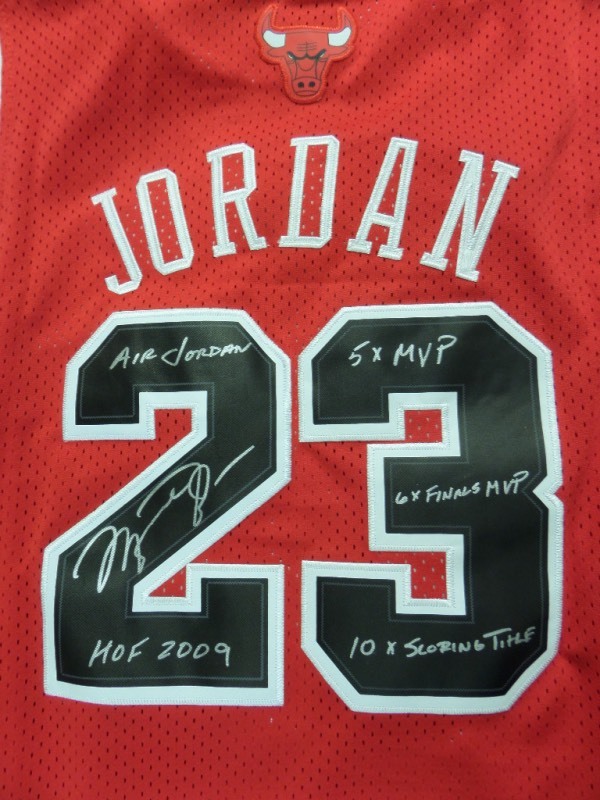 Coach's Corner - Michael Jordan hand signed Bulls "Stats" jersey. Go Back to Lot List Michael Jordan hand signed Bulls "Stats" jersey. This mint Nike product is a Chicago road red, trimmed in white and black team colors, and complete with sewn on everything including name on back. It is not only back #23 signed by the greatest athlete EVER in silver paint pen, but...grades a 15 on a 1-10 scale, and even has a bunch of career stats written as a bonus. It is simply perfect, and value is 3 grand, IF you could even find one like this.